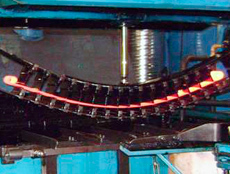 After cooling, the shot peening process is necessary for all parabolic leaves. For multi-leaf springs however, it is normally only the two safety-critical leaves that require shot peening. The bushes are pressed into the eyes and the stack of leaves assembled. Positive stresses are then introduced into the spring by a pre-stressing process.